Signed Esther Phillips lower right. Oil on board. 22" x 28"
​​​​​​​​​​Esther Phillips was born in Russian and raised in Pittsburgh, where she developed her talents as an artist. She was represented in numerous Associated Artist of Pittsburgh exhibitions and several independent "Pittsburgh Artists" events held at the Carnegie Institute in the late 1920's and early 1930's. Considered a "modern, creative and original artist of the day", her work was met with critical success, though she felt many of the local art patrons didn't understand modern art. Searching for a broader audience, Phillips moved to Greenwich Village, where she became a fixture of the painting scene for more than forty-five years. Though institutionalized for more than 6 years in the 1940s, she continued to paint daily, creating a variety of output detailing her daily experiences. She worked in a semi-abstract manner using her strong colors to create mood. Like some of the modernists, she would arrange objects in her paintings that she wanted to highlight with little regard to scientific perspective. Her paintings were thoughtful, modern undertakings of subjects important to her including waterfront scenes of barges, tugboats, and other industrial activities. 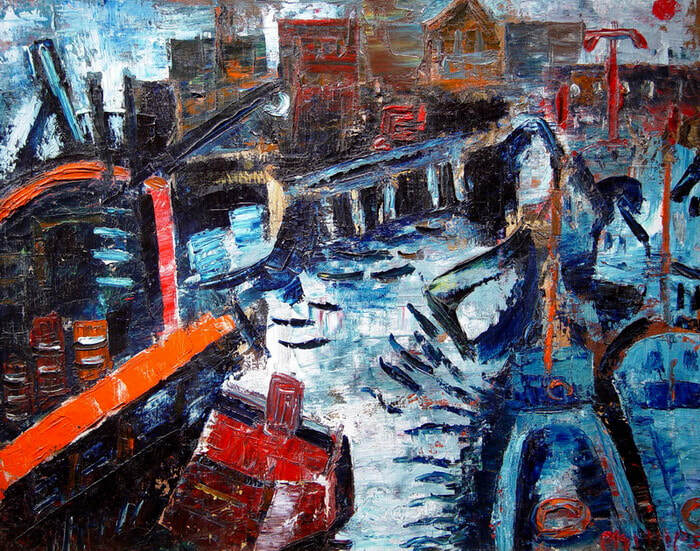 Coney Island and Staten Island were frequent subjects of her paintings. Some of her work from this period has been likened to that of Andre Derain. Credit: Biography of Esther Phillips, This Fantastic Struggle: The Life and Art of Esther Phillips by Lisa A. Miles.